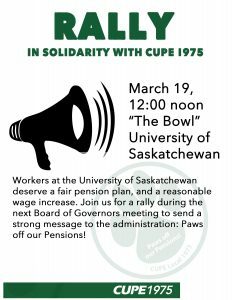 The University of Saskatchewan continues to force Local 1975 needlessly towards job action. Their latest proposal is a further step backwards. 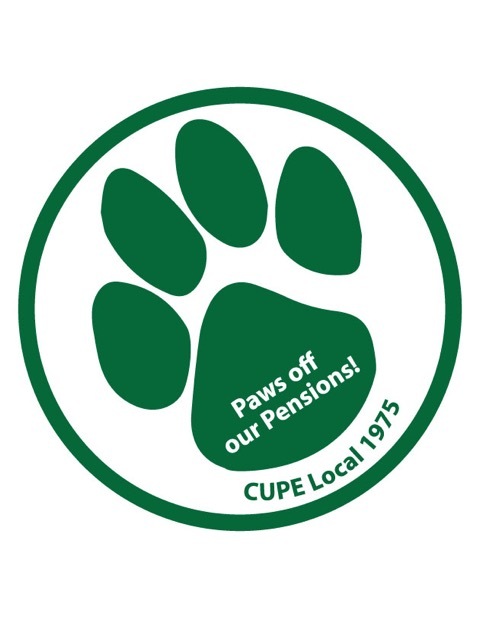 They have withdrawn their pension proposal and let us know that – instead of bargaining changes – they plan to make unilateral changes to your pension plan without any input from the union. We are concerned they plan to convert the defined benefit plan to an inferior defined contribution plan in the near future. They have withdrawn their revised compensation model proposal and are still offering 0-0-0-2-2, with a $3000 signing bonus. The proposed signing bonus is not available for FAPA students, casuals, and recurring relief and is pro-rated based on FTE. A 3-year wage freeze means a loss of tens of thousands of dollars in wages over a career of work for an average CUPE member. Members who are at the top of their phase, will not get a wage increase at all for the term of this Collective Agreement. Your bargaining committee wants to reiterate that our pension plan is the cheapest pension plan per employee on campus, and costs less than 1 percent of the operating costs of the University. 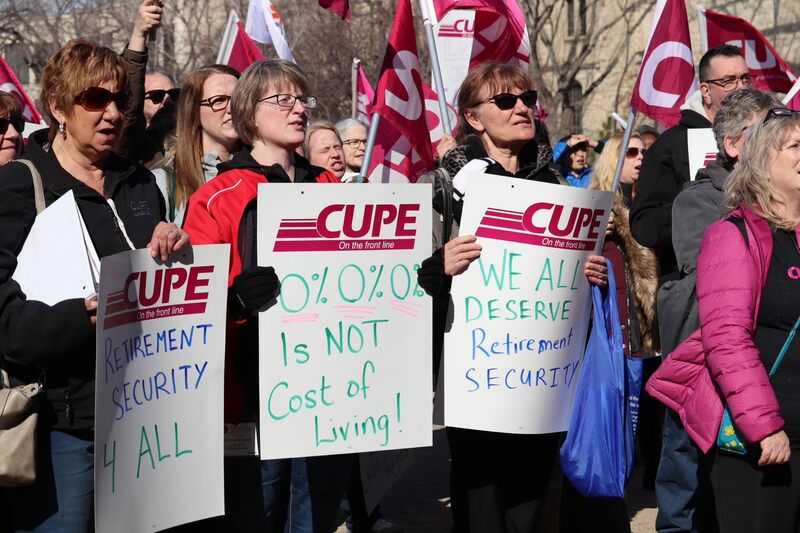 We firmly believe that our members deserve a say in their retirement security, deserve a secure pension after a career of work, and that all changes to the pension plan should be negotiated at the bargaining table. 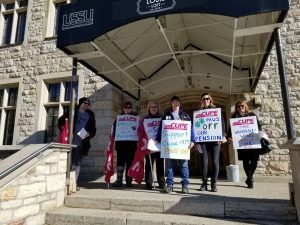 CUPE has spent much of the last month in essential services hearings, at the University’s insistence. At these hearings, the University has been making the case that the work our members do is so essential, that they should be deprived of their Charter rights to take job action. This latest step backwards at the bargaining table proves once again that despite arguing that our members are essential in their eyes, we are clearly not valued or respected. The CUPE1975 and University negotiating teams will return to the bargaining table on the afternoon of Thursday, April 18th. Our bargaining team will be receiving a revised offer of which will be reviewed at that time. Updates will be posted as they become available. Come speak with your negotiating team and receive a free Tim’s coffee card. Negotiators Jeff Theis and Ryan Klassen will be available to answer your questions. We are not aware of any such hard limits that are not routinely waived by the federal government. Members in SK and elsewhere around the country routinely contribute directly to deficit payments without regulatory issues. Most public sector workers are in jointly-sponsored plans with full risk-sharing. Our governance proposal was clear and simple and follows best practices for pension governance from around the country. The pension plan already has an advisory committee which meets regularly. Our proposal would have essentially formalized this committee to act as the joint administrator of the pension plan. In our view, this is would not lead to any substantial increase in costs, and would benefit the University by sharing the current regulatory and compliance risks it faces alone in the current arrangement. We will of course continue to have differences of opinion on the pension plan. But we want to work those out at a joint table, rather than having changes imposed by the University (as the University has threatened to do). That is not a “complexity” – that is honest bargaining to find mutually-agreeable solutions, which we remain committed to doing. If the University had specific concerns with our proposed governance framework, they could have discussed them at the table, rather than simply rejecting our compromise proposal as a whole. We were clear with the University that our members do not want to give up their secure Defined Benefits in retirement, which cannot be delivered with a contribution limit for the University. We did, however, propose a clear compromise on the employer’s concern about risk – effectively offering to meet them halfway and share risk on a 50/50 basis which the University rejected. This builds on substantive proposals we made in the last round of bargaining that would have likewise shifted costs and risks. 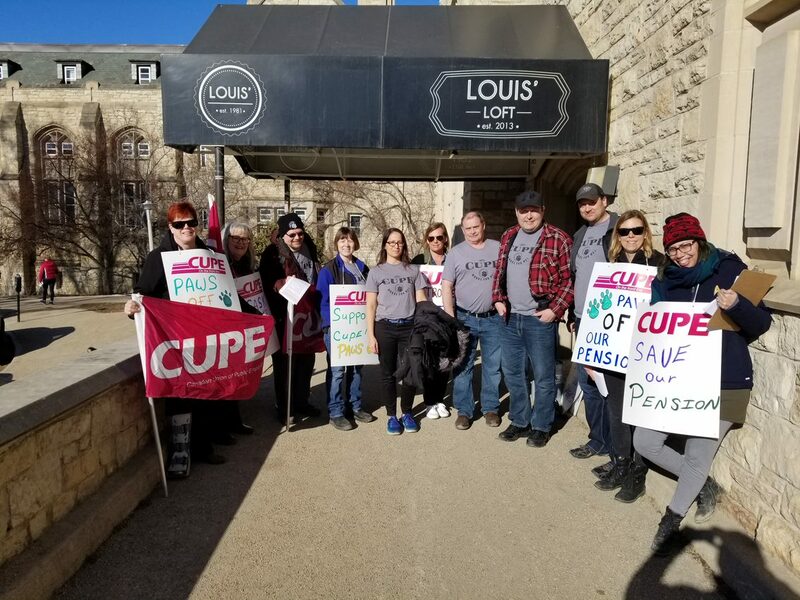 CUPE has been making significant efforts to make pension proposals that directly address the University’s stated concern. The University, on the other hand, has not moved from their insistence on Defined Contribution or Target Benefit plans since 2012. 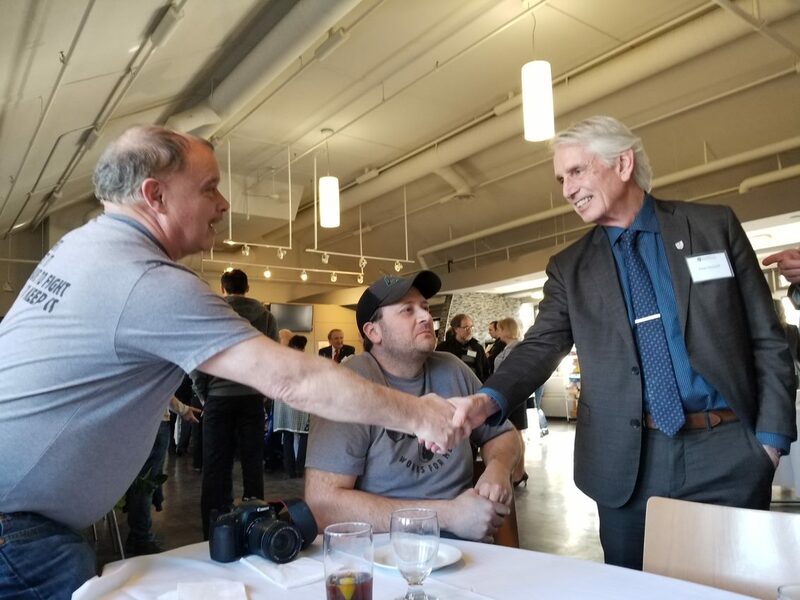 At the union’s request, the parties returned to the bargaining table on April 5, 2019. The intent of the meeting was to continue discussions about the union’s pension proposal. While discussions were cordial, unfortunately we did not make any progress. The Essential Services Tribunal will continue in May and June with closing arguments scheduled for June 14, 2019. We can expect a decision from the Tribunal at the end of June or early July. No job action can be taken until a decision is reached. No further bargaining dates are scheduled. Our proposal was a jointly-sponsored plan with a very conservative approach to surplus use, which we specifically chose to better meet the University’s stated concerns about risk. Plan surpluses can be used for different things – they can be spent on benefit improvements, used to reduce or eliminate required contributions to the plan (a contribution holiday), or they can remain in the plan to act as a buffer against future downturns. The University is incorrect that we proposed surpluses would only be spent on benefits. Our proposal actually said that all surpluses would not be spent and would remain in the plan (as a buffer against future downturns) until the plan was 120% funded. This is a very conservative approach. Having this buffer would help in keeping the plan out of deficit in a future downturn. Most other jointly-sponsored plans in the country would start “spending” surplus on benefit improvements at much lower levels. Having a high buffer like this, however, would help prevent contributions from rising in response to a future market downturn (i.e. directly addressing the main concern the University raised about pension costs). We could have left this buffer out and said that all plan surplus was for benefit improvements, but we did not. We set this high bar that directly benefits the University by helping to keep contributions stable. The University’s critique on this point reveals the reality that they don’t like our proposed restrictions on their ability to take even more contribution holidays in the future. We also indicated at the table that we were prepared to talk more about the surplus provision if the University was not satisfied with it, but the University never engaged on this point, rejected our position and is now raising these points in public instead of at the bargaining table. No job action (including withdrawal of services or lockout) can commence until we receive a ruling from the Tribunal. 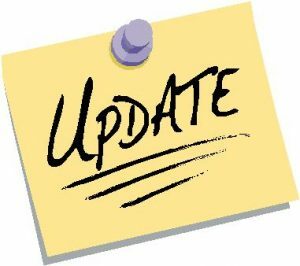 We will be back at the bargaining table on April 5th and will provide an update after that meeting. While fewer private sector employers are offering DB pension plans, this plan type remains standard in the public sector. 91% of public sector workers who have a pension plan have a DB plan. DB plans remain standard in the University sector, particularly for non-academic staff unions that CUPE represents. 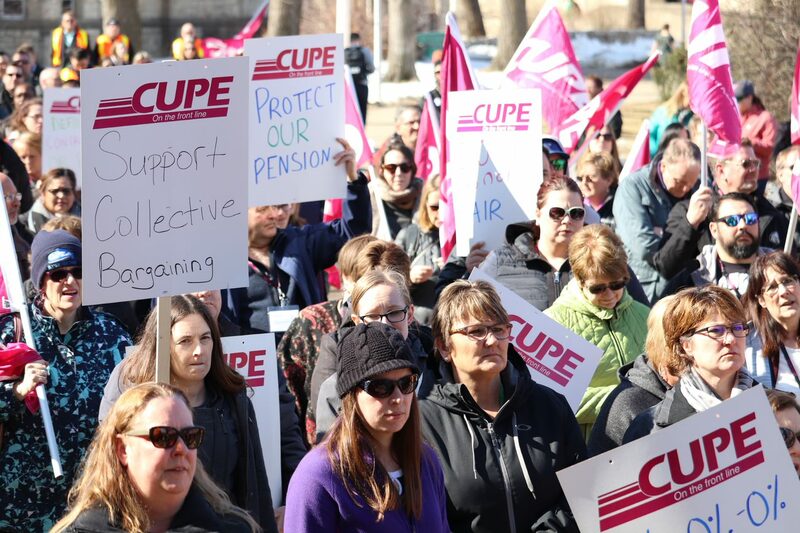 A very good article from reporter Kelsey Rolfe/March 29, 2019 which takes a look at CUPE 1975’s struggle with maintaining the Defined Benefit Pension plan. The Essential Services Tribunal hearing commenced on March 26-28. During those three days, testimony was provided by five of the ten employer witnesses. We are in the process of setting additional dates to continue the hearing. Once the University’s witnesses are finished, CUPE will submit its evidence. 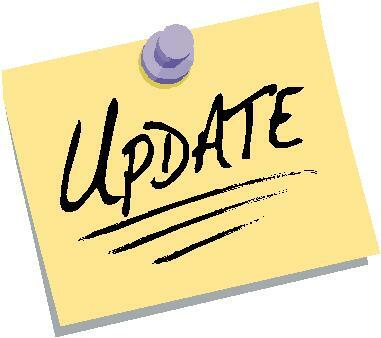 We will continue to update you throughout the process. The University has offered two different pension plans (Defined Contribution or Target Benefit) that share the same basic legal structure. In both proposed plans: 1) the University bears no risks and 2) plan members bear all of the risks. This is a complete change from your current DB plan, which provides secure, promised pension benefits that members can count on through their entire retirement. The University says they do not want any pension risk. They would prefer to see plan members with no real pension security, where your life in retirement will be tied to the whims of the stock and bond markets. These insecure types of pensions are not in any way comparable to the current DB plan. Upending the structure of the plan is apparently not enough, however. In both scenarios, the University also proposes lower contribution rates, which would save the University millions of dollars per year. For the average CUPE 1975 member, the employer would save about $2000 per year! (in addition to dumping all of the pension risk onto plan members). Roughly speaking, the “Target” benefit option actually aims to deliver about 25% less than your current DB plan does! And since the benefits are not promised like your DB benefits are, you may very well receive less than this. It’s all up to the markets and if you happen to work and retire at the “right” time. The DC option is even worse. We can’t say what it will deliver compared to the DB plan, since the benefits here are wholly dependent on market returns. This uncertainty is exactly why we don’t like DC plans. Given the contribution rates and the structure of the plan, the proposed DC plan is probably worth some 40-50% less than the DB plan you currently have. 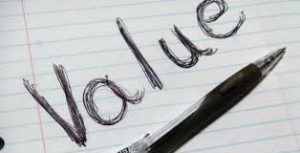 Complete risk shifting, massive cost savings and huge reductions in benefit value do not result in a “competitive” pension plan to your current DB plan! 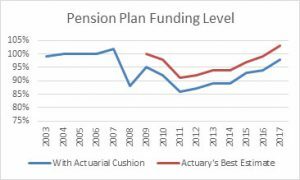 After nine years of being in deficit, the interim 2017 valuation revealed that the plan is now back in surplus (103% funded, $12 million surplus) on the actuary’s best estimate basis. If a 5% funding buffer (or “margin”) is added to artificially inflate the plan’s liabilities, the plan has a very slight deficit (98% funded). In either case, the funding level has improved materially over the past decade. Virtually all pension plans fell into deficit after the 2009 financial crisis – the worst market crisis since the Great Depression. Our plan fell to a low funding level of 86% in 2011. The important point is that the plan has been steadily improving its funding level since this low point. The existence of a deficit in any given year does not mean the plan is broken or in crisis. The pension system is designed to bring plans back into balance over time. The plan is also not “running an annual shortfall.” This suggests that the required contributions to the plan are not being made and that the plan has a structural funding problem. This is not the case. The “annual shortfall” the University refers to here seems to be a reference to the fact that the University contributes more than members do for the ongoing cost of the plan. The legal plan document says that members pay 8.5% of earnings into the plan, and that the employer must pay the remaining required contributions to the plan (and must at least match what members put into the plan). Currently, the ongoing cost of the plan is 19.87%. Members pay 8.5%, leaving the University to pay the remaining 11.37%. The University calls the difference between the member and employer rates (11.37% – 8.5% = 2.87%) an “annual shortfall.” There is no legal or actuarial principle that says that employers and members must equally share the ongoing cost of the plan. Our plan text does not say that members must pay the same as the employer. It is quite common for member contribution obligations to be fixed, as ours is, leaving the employer responsible to fund the remainder, which is often a larger amount, again, as it is in our plan currently. So this is not an “annual shortfall.” All of the required annual contributions to the plan are being made. The language used has likely been chosen (and left unexplained) by the University to advance their bargaining agenda: to convince you that your pension plan has a structural problem that does not really exist. This being said, we understand that the Employer does not like the fact that they currently contribute more to the plan than members do. Our pension proposal would reduce member benefits slightly on a go-forward basis and increase member contributions slightly to eliminate this differential. Ongoing costs would then be shared 50/50 in our proposal (eliminating what they call the “annual shortfall”). The University rejected this proposal. This is not true. The most recent actuarial report shows that University contributions have already come down significantly, with further reductions projected for the coming years. For example, in 2017, the employer required contribution to the plan was 16.14% of payroll. In 2018, the rate has fallen significantly to 12.84%. The rate is projected to be 12.05% in 2023 and then 11.37% in 2027 on wards. 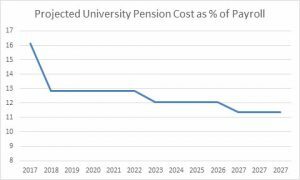 The Union’s pension proposal, which the University rejected, would bring this rate down even further to about 9%. The Saskatchewan Labour Relations Board has ruled that CUPE Local 1975 is allowed to withdraw from the Scope application, LRB File No. 120-12. This removes one of our legal barriers to taking job action. 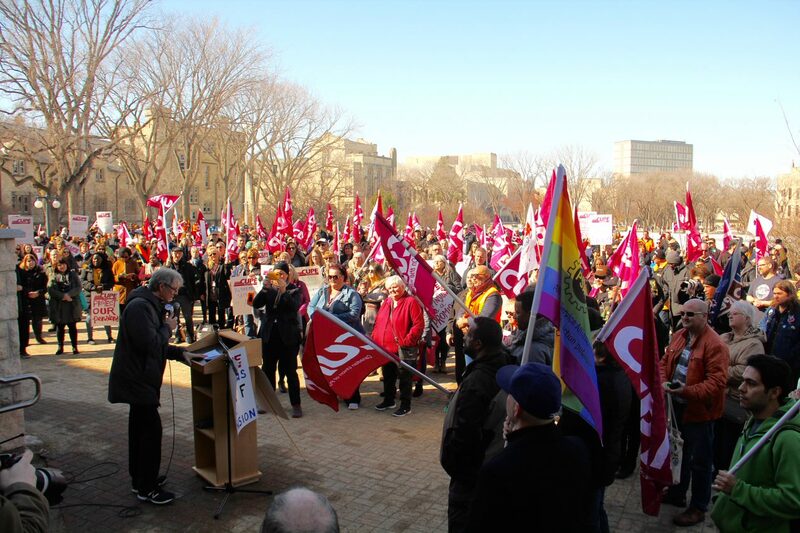 The Union will be in front of the Essential Services Tribunal on March 26-28. CUPE’s position is that the University of Saskatchewan does not meet the criteria of an essential services employer under the Saskatchewan Employment Act. We will update you after the hearing concludes. The parties are returning to the bargaining table on April 5th to further discuss the union’s pension proposal. The University took 17 years of partial contribution holidays between 1993-2009. The University is required to file papers with pension regulators each year, which clearly show these holidays. The Union has copies of all of these records. In nominal terms, these 17 years of partial holidays totaled nearly $28 million. Accounting only for inflation, they would represent more than $36 million in today’s dollars. Accounting for lost investment returns that could have been realized on these contributions – had they been made – would push a total figure even higher. It is also worth highlighting the 2009 partial holiday. 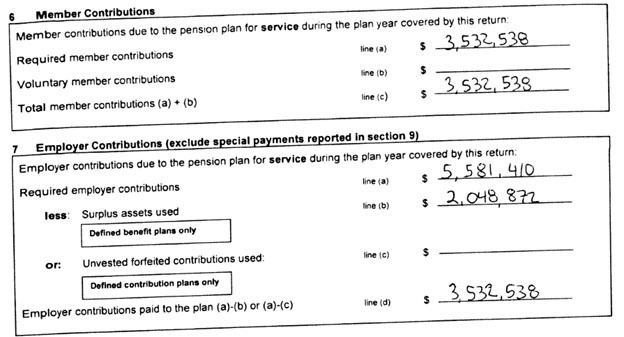 The year after financial crisis (when the plan lost 16%) and the year after the last cost-of-living increases to retirees were delivered, the University used $2 million of plan surplus to cover a portion of its own contribution obligation (see above). These decisions were not only unwise. The Union believes at least one and likely more of these holidays were illegal and violated the pension plan text. We have filed a grievance on this issue which we put into abeyance in a good faith effort to settle a collective agreement regarding pension. The Union has always acknowledged the cost of these additional contributions, which were largely the result of the 2008-09 economic crisis, the worst economic downturn since the Great Depression. 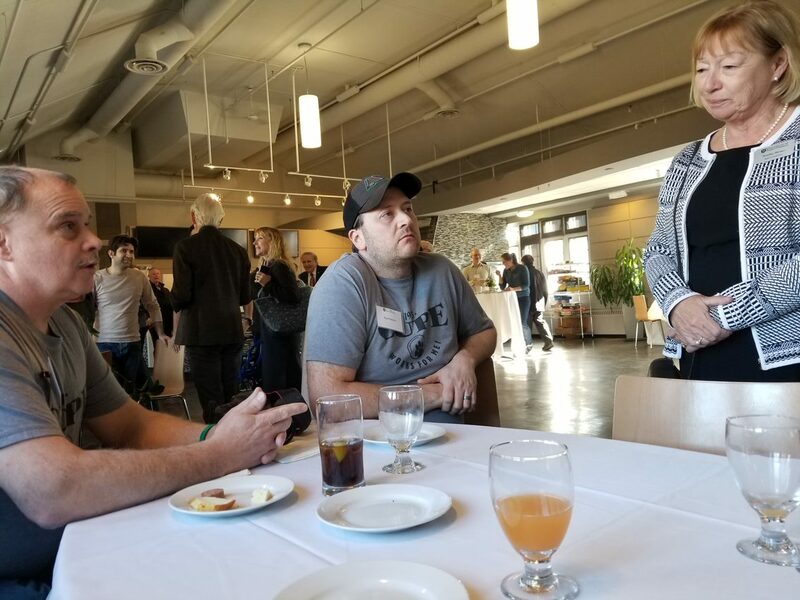 In this spirit, in the 2013-14 round of bargaining, the Union offered changes to the plan that would have seen Union members shouldering about half of the University’s special pension payment obligations – but the University rejected this proposal. And our current proposal would see any future deficits and pension costs shared on a 50/50 basis. This proposal was similarly rejected. And, as we detail below, these additional contributions have come down significantly in the past year, with further reductions projected in the coming years. The University should not be selective when discussing the plan’s history. To repeatedly only reference a challenging period following a historic economic downturn, when University contributions to the plan were higher than normal, is narrow and potentially misleading. The University should also speak about the 17 year period before the downturn, when the pension was in surplus and their contributions were reduced by using this surplus to take partial contribution holidays. And we should also speak about a better future. The Union believes we should learn from this history and allow more plan surpluses to remain in the plan. This would allow future plan surpluses to function as a reserve against future downturns, in the hope of preventing future increases in contributions. The plan pays a modest average annual pension of $18,100. The plan also does not provide guaranteed cost-of-living increases for retirees (also known as “indexation”). Indexation is provided on an ad hoc basis and has generally been delivered out of surplus, when surplus exists. As the cost of living increases each year, retirees under the plan do not know if their pension cheques will keep pace each year. The employer does not bear any pension liabilities associated with this risk. Pensioners have actually not seen an increase since 2008. Their pensions have since lost nearly 20% of their real value by not keeping pace with the rising cost of living. Most University plans in Canada offer better inflation protection. Your pension plan is sustainable. Your plan is not broken, nor is it in crisis. Language like this is used by employers to convince you that we need to abandon the pension to save the pension. This is untrue ideological language that the Employer is using to advance their bargaining agenda of attacking your retirement. Funding Level Improved. Like virtually all pension plans, your plan did fall into deficit following the global financial crisis of 2009 (the worst crisis since the Great Depression). This did not mean the plan was broken. The pension system is designed to bring plans back into balance over time. 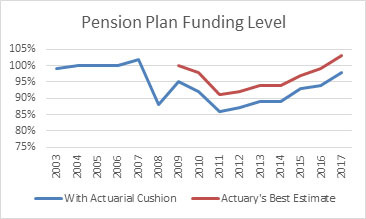 The plan’s funding health has since been steadily improving since the downturn, and the 2017 valuation shows that the plan is now back in a small surplus on the actuary’s best estimate. Universi ty Costs Significantly Declining. The 2017 valuation also allowed University contributions to decline significantly in 2018, with further reductions projected in the coming years. History of Plan Surpluses. The challenging period since 2009 follows a long period in which the pension plan was in surplus. 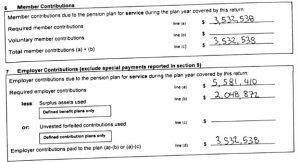 As described in more detail below, the University used significant portions of this surplus to reduce their own contributions to the plan (“partial contribution holidays”). Actuarial Basis Safer. Over the past decade, the University has accounted for the fact that Canadians are living (and will continue to live) longer and has made its actuarial assumptions more conservative, which lowers the risk of future deficits. These costs have already been factored into the plan. CUPE 1975 Reasonable Pension Partner. CUPE 1975 has always recognized the fact that the period after the downturn required the University to make extra contributions to the plan. In this and the last round of bargaining, we offered changes to the plan that would have significantly mitigated these cost increases. These proposals were all rejected by the University. Our offer in the current round would ensure that the burden of any future downturns would be shared on a 50/50 basis, on top of reducing annual University costs by millions. The University has rejected this offer. Solvency Funding Exemption. In 2013 the provincial government changed pension funding rules to exempt the University permanently from its “solvency” funding obligation, which makes the plan’s funding requirements much more stable over time, helping the University to fund the plan. CUPE publicly supported this exemption. Pension Costs in Perspective. The University cites pension costs in the millions in the hopes that members will be convinced that abandoning the DB plan is necessary to the institution from a financial perspective. The University’s budget is about one billion dollars. The total cost of your plan to the University is not even 1% of the budget. The extra contributions the University has made to the plan over the past decade is an even smaller number. Our pension proposal would shave these fractions even further. 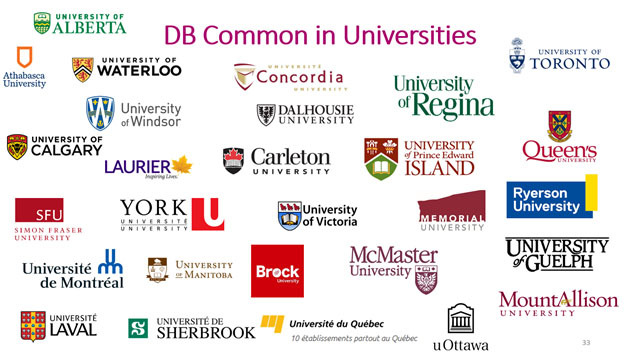 The University can afford our modest DB plan. Thanks for making yesterday’s rally such a success. I think it sent a strong message. Listed below Media articles and photos. President Peter Stoicheff – We are ready to meet and talk with the Board of Governors – Give us a chance! 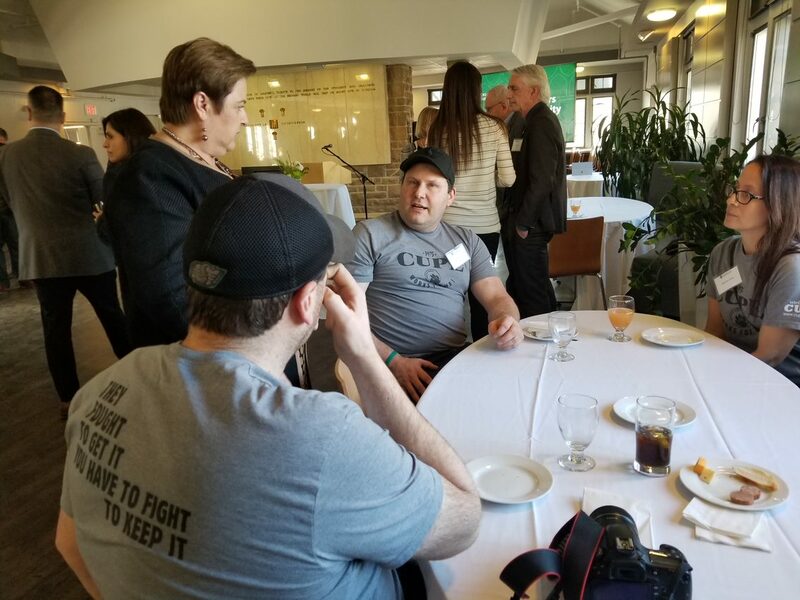 Photo taken at the Board of Governor’s reception on campus on March 18th. Craig Hannah, President CUPE Local 1975 and Peter Stoicheff share greetings. CUPE 1975 Members: Please join your Negotiation team today at our noon hour rally! If we make a little noise someone might just listen to us! Meet at Nobel Plaza in front of the Peter McKinnon Building at noon. We need to get the message to the Board of Governor’s that this University works only because we do! RALLY MARCH 19TH-SUPPORT YOUR BARGAINING TEAM! Friday April 5, 2019 has been confirmed. Look for updates on the website and Facebook after this date. Thank you to everyone who attended the March 11th Special Membership Meeting. Please take the time to read the attached document put out by our CUPE 1975 Bargaining Team. 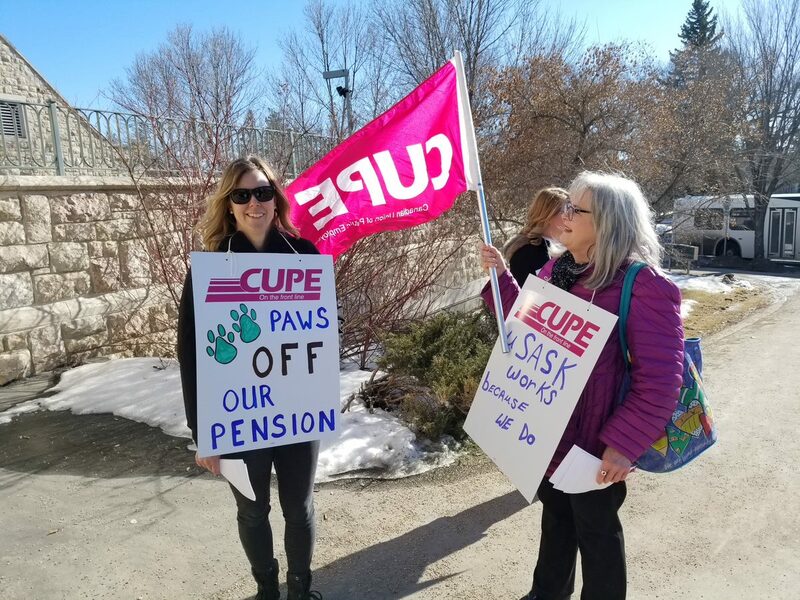 A big thank you must go out to Mark Janson, CUPE National Pension Expert and Ann Iwanchuk, our CUPE National Servicing Rep.
CUPE 1975 members are working harder. Students and square footage of buildings on campus have grown significantly over recent decades. But CUPE 1975 job numbers haven’t grown at all. Senior Administrator positions, on the other hand, have doubled over this time! What’s our reward for working harder? Your employer is proposing to gut your collective agreement with massive wage and pension concessions. The University can afford our proposal. Our pension plan currently costs less than one per cent of the University’s annual budget. 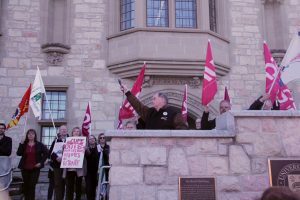 The Chair of the University’s Board of Governors says that the University’s strong credit rating is “a key indicator of the University’s excellent financial management and financial situation.” Other pension plans on campus (even though they are significantly inferior plans) cost much more per member, because CUPE 1975 members are not paid as much as other workers on campus. The University’s proposed “signing bonus” is being used to gloss over a 3 year wage freeze. A lump sum like a “signing bonus” is paid only once, whereas the wage increases CUPE 1975 is proposing are paid every year for the rest of your career (including on a retroactive basis). CUPE 1975’s wage proposal would mean more retro pay than the “signing bonus” for the vast majority of members, with the real bonus of higher wages going forward for all. 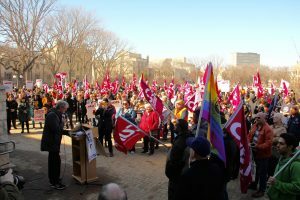 The University’s proposed wage freeze is a massive, permanent concession that will mean tens of thousands of dollars in losses over the working and retired lives of most CUPE 1975 members. 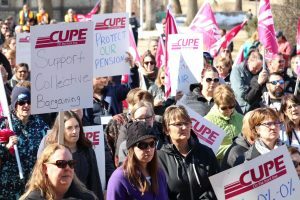 Within a decade, the average CUPE member would have lost a total of about $25,000 from the gaping hole in their annual earnings left by the 0/0/0. The University wants to replace your modest but secure defined benefit pension with one of two inferior pension options. They want to shift all of the pension risks onto the backs of their hard working staff, who will be left not knowing what they will receive in pension each year of retirement. Insecure pensions earned going forward could be worth around 20-25% less than the modest but secure benefits workers currently earn. But since the University is pushing a non-guaranteed plan, these cuts could be even greater. Workers deserve more. The vast majority of public sector workers and University workers in Canada continue to be members of DB pension plans. The University of Saskatchewan should be no different. CUPE 1975 has proposed a full compromise which would share the risks of funding secure DB benefits between active members and the University, on top of saving the University millions each year in pension costs. Our reasonable compromise proposal was rejected by the University since it did not represent a full capitulation to their pension agenda. Past pension promises are under attack in Canada. Other governments have implemented or are considering implementing legal changes that would allow employers to walk away from pension promises they have already made to workers and retirees, replacing guaranteed pensions retroactively with insecure target benefit pensions. If the Government of Saskatchewan followed suit, the University could implement similar changes, unless CUPE 1975 has joint control of your pension plan. This is what we are trying to achieve in this round of bargaining. The stakes are incredibly high for all active and retired members. Our pension plan is sustainable. Most plans fell into deficit after the global financial crisis a decade ago, but our plan has been steadily recovering since and is now essentially back in balance. 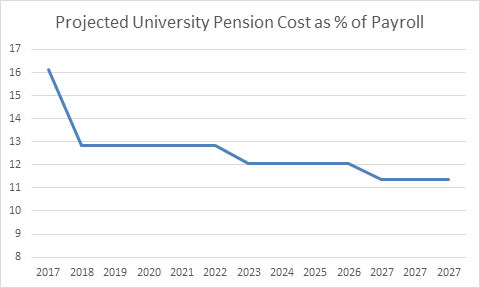 University pension costs have come down dramatically over the past year, with further reductions projected in coming years. When the plan was in surplus for decades prior to the financial crisis, the University was happy to take $28 million of “partial contribution holidays” over 17 years – essentially using our pension surplus to pay portions of their own required contributions to the plan. Local 1975 is fighting to protect our pension plan. We are fighting for fair wage increases. We are fighting for you. And with your help, we can win. Bargaining with University for March 15th postponed. Please be advised that CUPE Local 1975 has had to postpone our bargaining session with the University that was scheduled for March 15th. Our National Representative had a death in her family and the funeral is on that day. We are in the process of securing an alternate date. You MUST attend the meeting and sign the attendance record for you to be paid for your time. It is CUPE’s desire to achieve a collective agreement at the bargaining table. 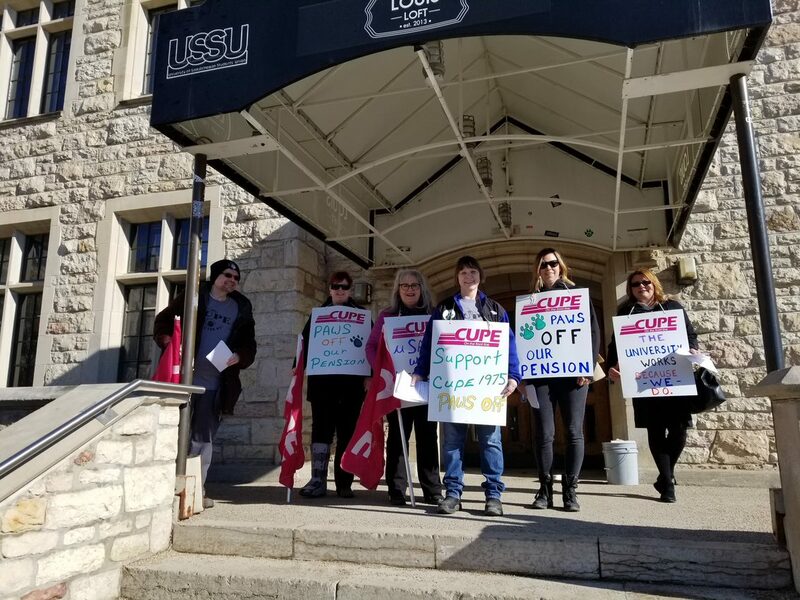 CUPE has reached out to the University of Saskatchewan through the mediator, with a request to meet, and the employer has agreed to return to the bargaining table. 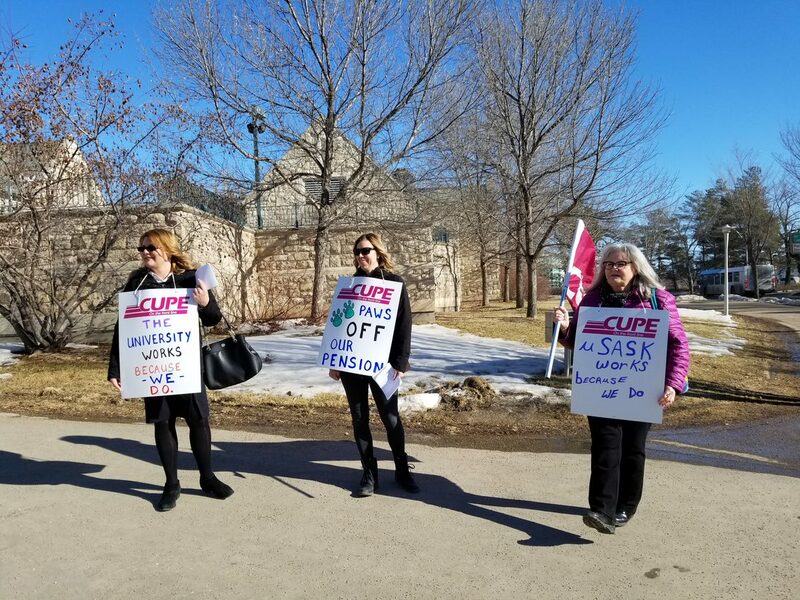 It is CUPE’s intent to have discussions with the Employer about questions and concerns they have raised through their website about our Jointly Sponsored Pension Plan proposal. The meeting has been scheduled for March 15, 2019. On Thursday, Feb. 28th the Labour Relations Board heard arguments from CUPE and the University regarding whether or not the U of S is an essential services employer. The Labour Relations Board determined they needed a full hearing before they could make that determination. Dates for the hearing have been scheduled for March 26-28. A fair pension plan, reasonable wage increases. We deserve this. Please see attached for the Feb. 26th Media release and the Pension Brief to the Board of Governors which were discussed at the Feb. 26, 2019 meeting. As many of you have heard or seen over the last few hours the CBC and the Star phoenix among others have reports on our special meeting/media conference held on Tuesday at noon. Thanks again to those of you who attended and we apologise to those of you that were unable to find a spot in the room. We were unable to source a larger room and we felt that we really needed to bring this fight to the decision makers of the University, Peter Stoicheff and the Board of Governors. The first half hour focused on bringing the media up to speed on our side of the story and to hear from other unions on campus – ASPA and the Sessional Lecturers’- about their thoughts on our struggles and the common problem all unions on campus are having in dealing with this administration. We didn’t have any “new information” to share with you the members but we did field a number of questions regarding the letters many of you received with the employers spin on their previous offers. This was not a new offer and it is not one we will vote on. There were many questions in regards to the proposed wage model. We had agreed at the bargaining table to listen to their proposal in regards to a new wage model but we are far apart on accepting or agreeing to anything. As many of you would recall at our open house a month ago we pointed out that using all the “employers” data, 42 per cent of you would be limited to a 1 per cent increment “at best” in the first year of this proposal, and we know that 42 per cent would increase each year afterwards. It would not take long before we would be at over 50 per cent of our membership receiving 1 per cent or less of increment annually. Of the 42 per cent of you impacted by “The University’s” offer, we have heard from a number of you that would be placed in the top of a phase with no wage increases, through the increment model or through negotiated wage increases for years. This model is not in our best interest to accept but you can see why the University wants to implement it. IT SAVES THEM MONEY. It decreases their payroll costs, just as implementing a different pension plan would SAVE THEM MONEY. Just as a signing bonus of 1500, or 3000 dollars would SAVE THEM MONEY. We are planning to host another Open House in March and we will present to you what the “dollar” difference will be instead of just percentages. 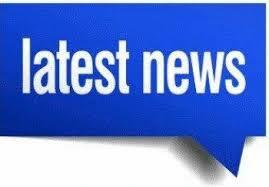 Please follow our web page and FaceBook page for times and dates. We look forward to seeing you there and answering all your questions and concerns. Thank you to all the members who came out to support the press conference and receive clarity on some issues they had. A big thank you to the other locals unions on campus who came out and voiced their support for our fight and to acknowledge that they too, had similar issues and concerns with management at the University. As you all saw the University continues to present their same offer while trying to spin it as being a generous offer. We do acknowledge that they are creative in their spin we only wish they would spend as much time and energy on trying to achieve a fair and equitable contract to our members. We are looking at hosting more information meetings in various forms in the upcoming months to answer any and all questions and concerns you might have as we pursue our goal of negotiating a fair contract for all of you. Thanks again. Your support is appreciated. Special meeting with a press conference. Further to this we will be having another special members meeting in late March for those who were unable to attend the last special members meeting. This meeting will address some outstanding issues pertaining to bargaining. Please be aware that registration must be done through the CUPE 1975 office, not through the link that is on the brochure. 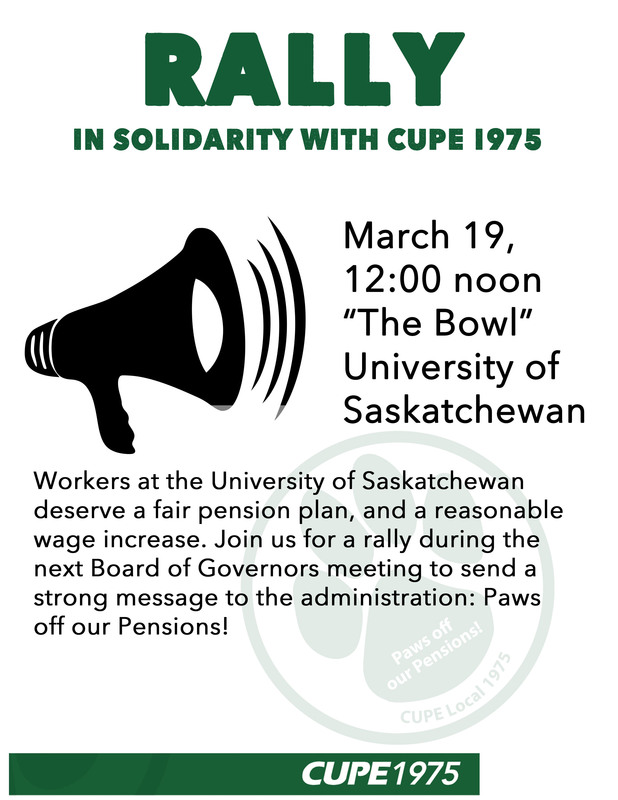 Call the office at (306) 966-7015 or email at cupe1975@sasktel.net if you are interested in registering. There are a limited amount of spaces available. We want to see your CUPE swag! Send a photo of yourself wearing CUPE gear to the Facebook group (CUPE 1975) for a chance to win Blades tickets. You will be notified by email on Thursday afternoon if you are a winner. 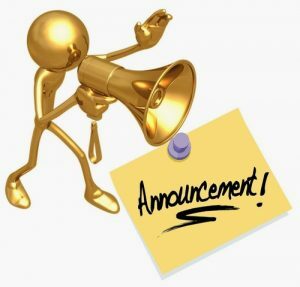 Please be aware that photos will be posted on our Facebook group, (CUPE 1975) which is a closed group for members only. If you do not wish for your photo to be used you can privately email us the picture to enter the contest, but indicate you don’t want your image used. The CUPE1975 and University negotiating teams will return to the bargaining table on the afternoon of April 18th. Our bargaining team will be receiving a revised offer of which will be reviewed at that time. Updates will be posted as they become available.